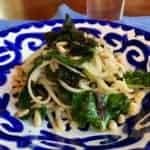 Ready in 20 minutes, Linguini with Swiss Chard is an economical, quick-to-fix recipe, filled with flavorful foods that deliver health benefits galore! Popeye was on to something. When the sailor ate spinach, he morphed into a superhero—with super strength to fight off his enemies. 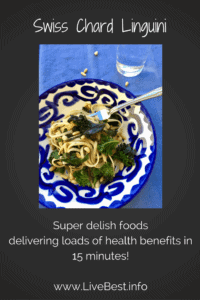 Though your biceps won’t explode when you down a can of spinach, dark green, leafy vegetables are nearly superheroes. Phytochemicals protect plants from their enemies. When we eat them we absorb the compounds that strengthen our cells to fight off our enemies: heart disease, stroke, brain deterioration, diabetes, and certain cancers. Potassium is the superhero against sodium. Potassium helps maintain healthy blood pressure by blunting the effects of sodium, plus it decreases bone loss, and may reduce the risk of developing kidney stones. Potassium-rich foods include potatoes (white and sweet), white, lima and kidney beans, tomato products (including juice and red pasta sauce), lentils and spinach. Green, leafy vegetables also supply eye-friendly compounds—vitamin C, lutein, and zeaxanthin—which may reduce the risk of cataracts and macular degeneration, the leading cause of blindness in Americans. Dark green, leafy vegetables are so power-packed that they are called out in nutrition recommendations as foods to eat more often. How often should you eat vegetables? 1 1/2 to 2 cups per week. Which ones? Broccoli, spinach, leafy salad greens (including romaine lettuce), cabbage, bok choy, kale, turnip greens, and green herbs such as parsley and cilantro. How to cook vegetables. Stir-frying, steaming, a quick sauté or raw are cooking styles that maximize flavor and minimize odor. Because they tend toward the bitter side, adding other ingredients may increase their number of Likes! Shred a slaw with raw Brussels sprouts. Fill a jar with cabbage, broccoli and whole grains. Sauteed Swiss chard shines in the quick-cook recipe that comes together in 20 minutes. 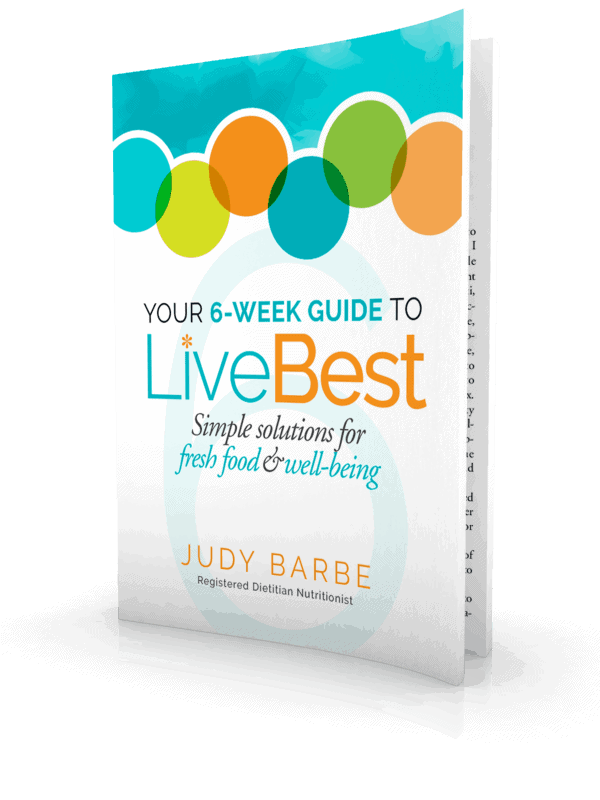 It is filled with super delish foods that deliver all sorts of health benefits. 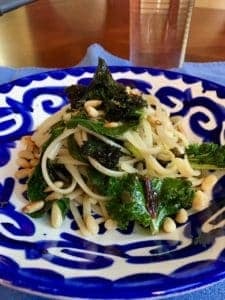 Ready in 20 minutes, Linguini with Swiss Chard is an economical, quick-to-fix meal, filled with flavorful foods that deliver health benefits galore! Pasta: Cook the pasta according to package directions. When pasta is almost done, still a little firm, scoop a cup of pasta water, then drain pasta. Vegetables: Meanwhile, in a large skillet over medium heat, add the olive oil. In about 2 minutes add anchovies and capers, cook 5 minutes, stirring occasionally to break up anchovies. Add garlic and red chile flakes, cook 2 minutes, stirring so that garlic does not burn. Add lemon zest, greens and ½ cup pasta water. As they cook, the greens will shrink. Stir to combine ingredients. Remove garlic cloves. Add cooked pasta. Stir to mix together. Squeeze lemon juice over top. Sprinkle pine nuts. 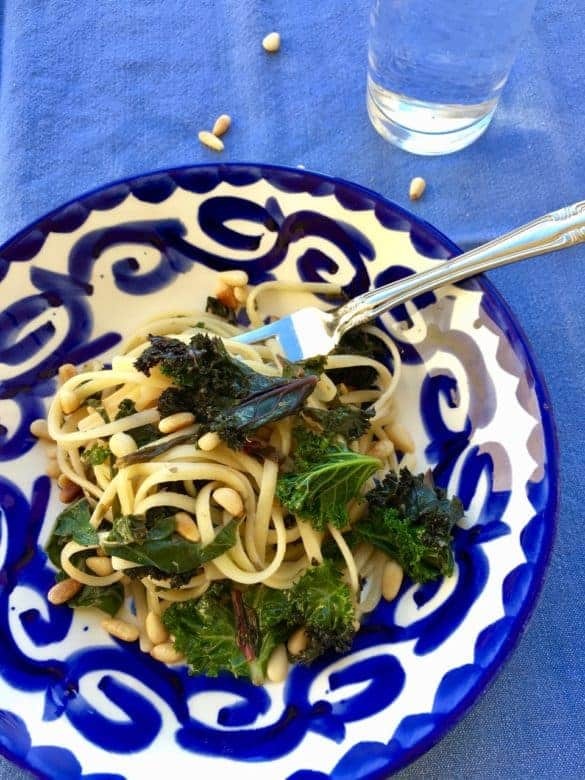 Think of this as pasta with greens. Swiss chard, spinach, kale, mustard or collard greens all work. Some can be tougher than others so may take a little longer to cook.